I loved this book. It was written for teen readers I think, and I read it after I had surgery. It was the perfect book for recovery–light, interesting, and engaging. The story is about an ex-con who rents a room in London and figures out that he can use the London sewer system to rob the houses of the rich. He does so and creates two distinct personalities for himself: one of the rich gentleman and socialite, and the other as a dirty servant. He has to juggle these two personalities and keep up the charade in-order to enjoy the high life. I started getting into that strange genre of literature called “fiction.” Fiction seems to be a catch-all for every book type that doesn’t quite fit under any other subheading. This is a great example of fiction. A lower-middle class blue collar man is approached by a very rich, very famous gentleman who wishes to rent the basement for the summer. The house owner allows it, and the rich man moves into a cage. He leaves strict instructions: no outside contact, no letting him out of his cell, provide food. For this, the house owner gets a huge amount of money. The book centers around the rich guy’s life and why he has chosen to incarcerate himself in an unknown location. Interesting stuff happens, and the book ends satisfactorily–almost. 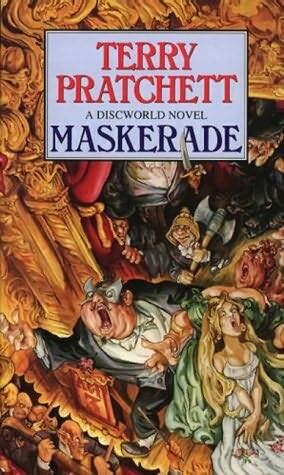 Another Terry Pratchett book, except I liked this one better than most of his work. He makes a fairly obvious critique of Hollywood and the resulting movie culture in this book that is hilarious to anyone who has lived in Southern California, been in movies, seen movies, heard about movies, or met an actor. Mr. Pratchett is best when he is composing sly social commentary, and this book showcases his talent beautifully. A nice example of the SLM with a memorable protagonist. The main character is the head house keeper for a detective at Scotland Yard. She takes it upon herself to help her employer out with difficult cases, always making sure to make her boss believe all her conclusions were originally his ideas. The premise makes it interesting and the characters see it through. A good over-all read. It was hard getting through this book. A medieval mystery with a motley crew of characters sounds like a good idea, but it just didn’t seem to deliver. It took me a long time to finish the book, and it wasn’t at all memorable. Once again, a great book that got turned into a mediocre movie. This story is written from the viewpoint of a journalist that visits Savannah (Georgia?) to learn about the lives of the inhabitants. It is really a collection of individual stories, each staring a different memorable character of the town. The stories are woven together around a murder mystery and the resulting trial. The plot is engaging and keeps the reader riveted throughout. The movie sucked, however. I hate that.